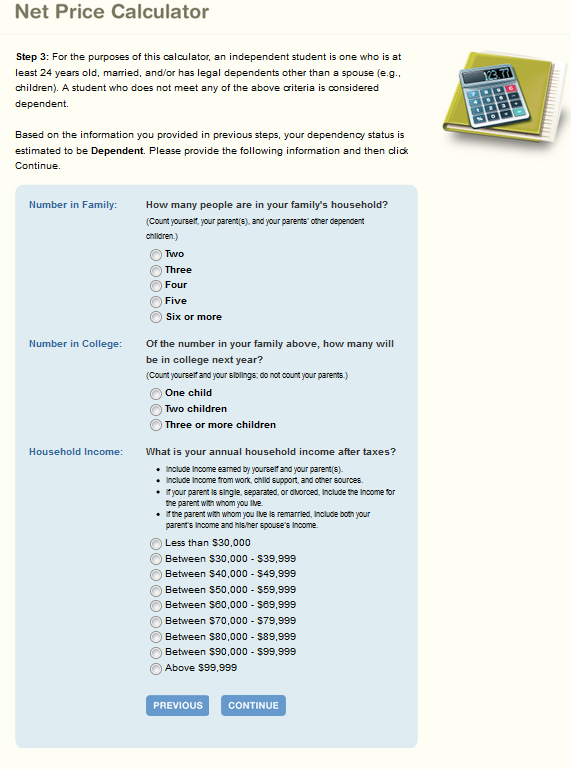 Net price calculators are designed to give students and their families a clear idea of how much college will cost them each year after taking available financial aid into account. All colleges have to post a net price calculator under the Higher Education Opportunity Act of 2008, but these calculators take a range of different form. The Department of Education has proposed a standardized “shopping sheet” which has been adopted by some colleges, but there is still a wide amount of variation in net price calculators across institutions. This is shown in a 2012 report by The Institute for College Access and Success, using 50 randomly selected colleges across the country. In this blog post, I examine net price calculators from six University of Wisconsin System institutions for the 2013-14 academic year. Although these colleges might be expected to have similar net price calculators and cost assumptions, this is far from the case as shown in the below screenshots. In all cases, I used the same student conditions—an in-state, dependent, zero-EFC student. 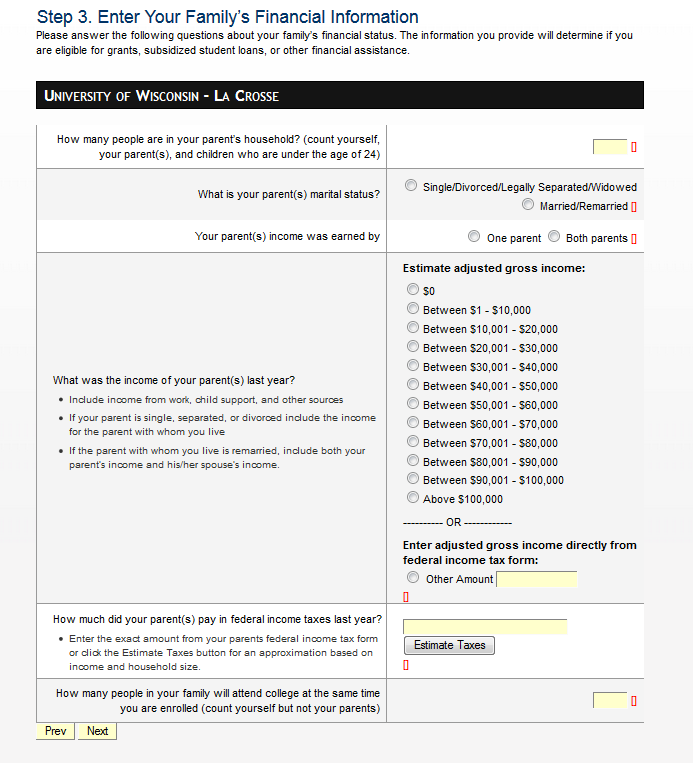 Two of the six colleges selected (the University of Wisconsin Colleges and UW-La Crosse) require students to enter several screens of financial and personal information in order to get an estimate of their financial aid package. While that can be useful for some students, there should be an option to directly enter the EFC for students who have filed the FAFSA or are automatically eligible for a zero EFC. For the purposes of this post, I stopped there with those campuses—as some students may decide to do. 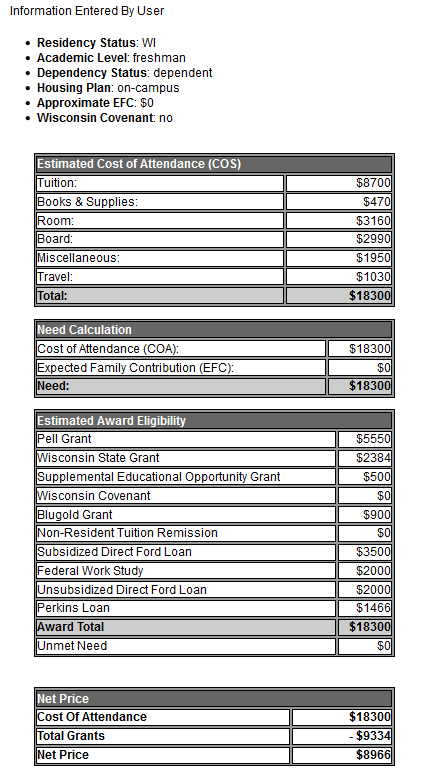 UW-Milwaukee deserves special commendation for clearly listing the net price before mentioning loans and work-study. Additionally, they do not list out each grant a student could expect to receive, simplifying the information display (although this does have its tradeoffs). 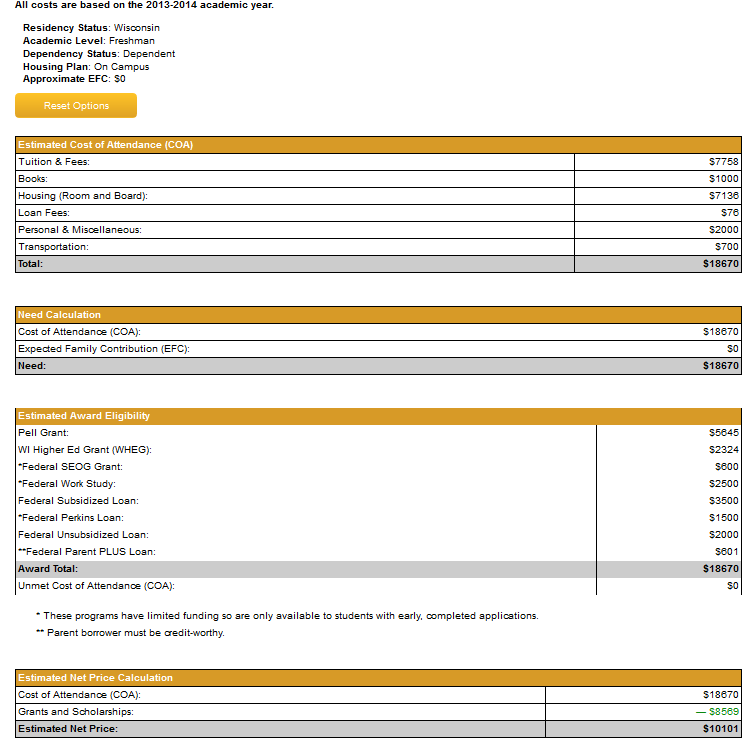 The other three schools examined (Eau Claire, Madison, and Oshkosh) list out each type of financial aid and present an unmet need figure (which can be zero) before reporting the estimated net price of attendance. Students may read these calculators and think that no borrowing is necessary in order to attend college, while this is not the case. The net price should be listed first, since this tool is a net price calculator. 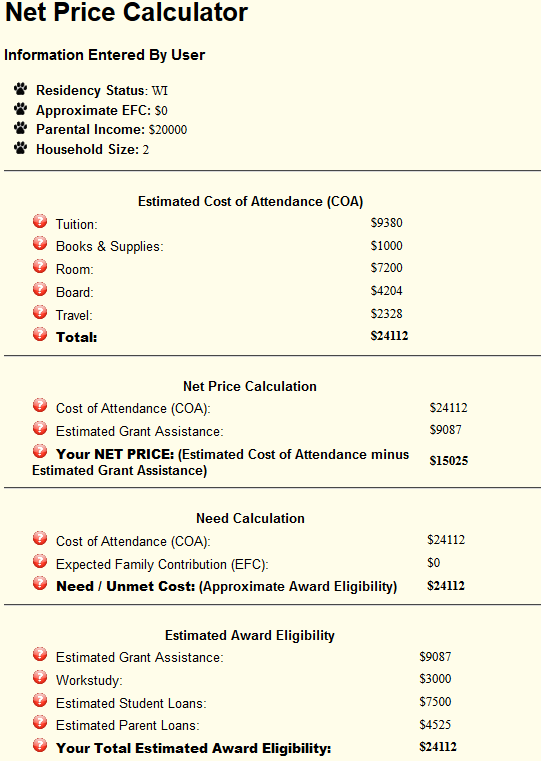 The net price calculators also differ in their terminologies for different types of financial aid. For example, UW-Eau Claire calls the Wisconsin Higher Education Grant the “Wisconsin State Grant,” which appears nowhere else in the information students receive. The miscellaneous and travel budgets vary by more than $1000 across the four campuses with net price calculators, highlighting the subjective nature of these categories. However, they are very important to students because they cannot receive more in financial aid than their total cost of attendance. If colleges want to report a low net price, they have incentives to report low living allowances. 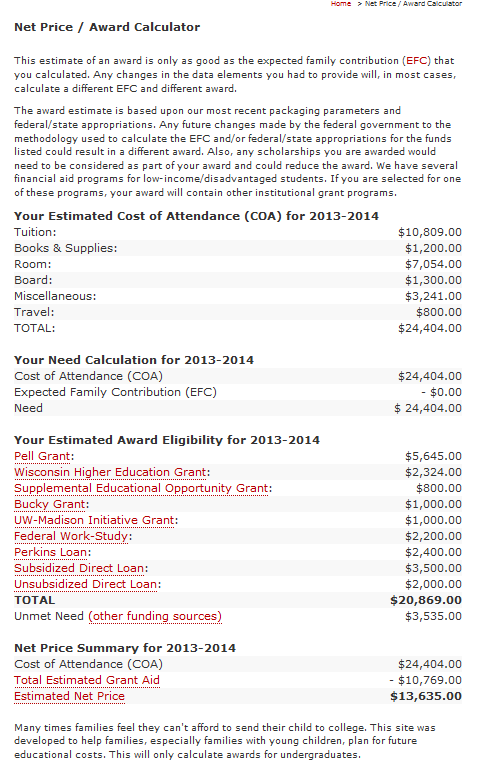 I was surprised to see the amount of variation in net price calculators across UW System institutions. I hope that financial aid officers and data managers from these campuses can continue to work together to refine best practices and present a more unified net price calculator. Typically students in high school start using an NPC near the end of their junior year – well before they have prepared a federal student aid application (FAFSA), which is the reason so many financial questions are asked. Students should be encouraged to use NPCs at least a year before applying so families can fine-tune their financial plans well in advance of students applying to colleges. Thanks for the comment. There is a tradeoff between getting the most accurate estimate possible and not overwhelming students and their families. At the very least, there should be an option just to enter the EFC and bypass the lengthy calculation. It’s a question of whether students are better served with a rough estimate that is easy to get or with a more detailed estimate relying on a range of FAFSA characteristics. Do you have any empirical evidence that high school juniors often use NPCs? I haven’t seen much data on when students use NPCs or whether they actually provide students with useful information. Hopefully, groups like NASFAA can keep pushing forward on this. “Empirical evidence” – not a lot yet but the nearly 700 campuses using Student Aid Services’ custom net price calculator do report many ‘rising seniors’ using NPCs much earlier in the college-planning cycle. This new financial transparency is encouraging families to examine costs earlier now that they have greater insight about their personalized cost before applying to colleges. SAS’ custom NPCs take only 8 to 12 minutes to use – a very brief amount of time to get accurate insight into potential costs and financial aid. The earlier high school students are aware of costs and can compare affordability and academic fit, the better choices they make. So many students quit or transfer colleges because during college-planning they didn’t know their costs and discovered how financial burdensome their choice was after enrollment. Also, the NPCs based on the federal template are inaccurate because they do not follow the FAFSA EFC formula (strange but true), are based on two-year old cost data, and make merit estimates based on need questions. My conversations (I’m a fin aid professional) with GCs and their state association leadership members on the concept of net price calculators has netted only looks of confusion and fear on their faces when asked how they’re utilized in their overall college planning process. More needs to be done in building awareness of how and why these should be used; furthermore, there should be a greater demand for clarity on entire NPC process. We need more blogs such as Robert has done here to help get the message out there. Colleges such as Fordham University, DePaul University, Indiana State University and others are using net price calculators to start a two-way conversation with interested prospective students earlier in the college planning cycle. Using data gained from their custom NPCs, they dynamically generate a Personal Student Prospectus, a color brochure that details for an individual their very specific cost, aid, academic interests, and post-graduation employment opportunities. While some college administrators have concerns about cost transparency, others embrace it. Many others see the NPC mandate as an opportunity more than anything else. An accurate NPC is the most concrete way to remove sticker shock and families are hungry for personalized and accurate information. For example, in just 10 minutes, McDaniel College’s NPC produces reliable merit and need-based aid estimates. It allows students to register and returning students to log-in to either finish using the NPC or re-try it with new academic or financial information. It also features a progress bar, and questions about military service and siblings in college, both of which could lead to larger aid estimates. McDaniel College’s custom NPC is used as a marketing tool for the college. The NPC has been showcased on the homepage of the college’s website, specifically during its first year, and continues to have top billing on the financial aid web page. The admissions and financial aid staff introduce the NPC during events for prospective students and in its print marketing. Every information session for aspiring students features McDaniel College’s NPC. The majority of McDaniel College’s NPC users provide their name and address, an indicator of high interest in the school. In the first two years, nearly 20 percent of admitted first-year students used McDaniel College’s NPC to get their personalize and accurate cost estimate. I’m interested in your statement that the net price calculators get interest from prospective students earlier in the planning cycle. Do you have analytics on what times of year the NPC is most heavily used? That would be a nice contribution to what we know on the utility of NPCs. Next Next post: Can “Paying it Forward” Work?